USA Today noted roofers as the 4th most dangerous job in America and says that “a vast majority of fatal accidents that occur on the job — 80.2% — are also categorized as general falls, slips, and trips”. There are many factors that contribute to these hazards such as heights, seasonal weather, daily conditions, and slippery surfaces. 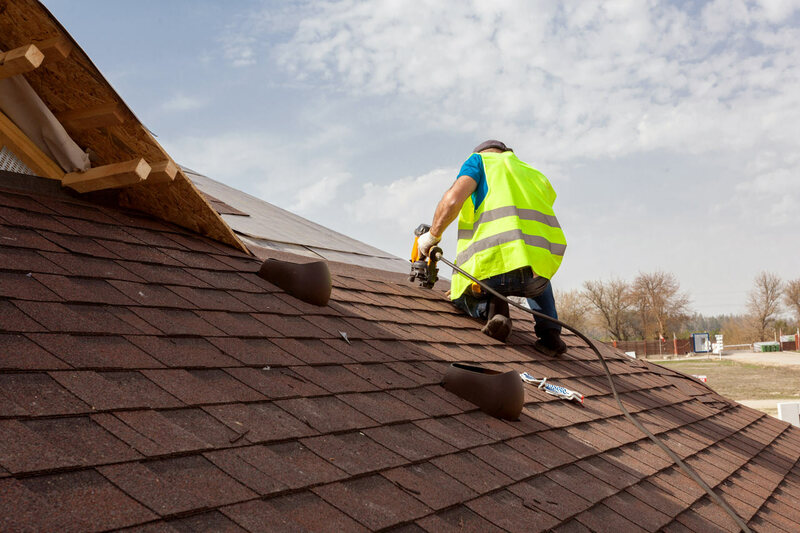 When the roofer isn’t using proper roofing tools designed for the job, it can become a safety issue and make for a treacherous working environment. One way to reduce the chances of injury is the use of proper equipment and tools designed for the specific task with the skill to do so. 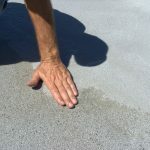 It also increases the efficiency of the roofer when they are not trying to use the wrong tool for the job and taking chances with their safety. 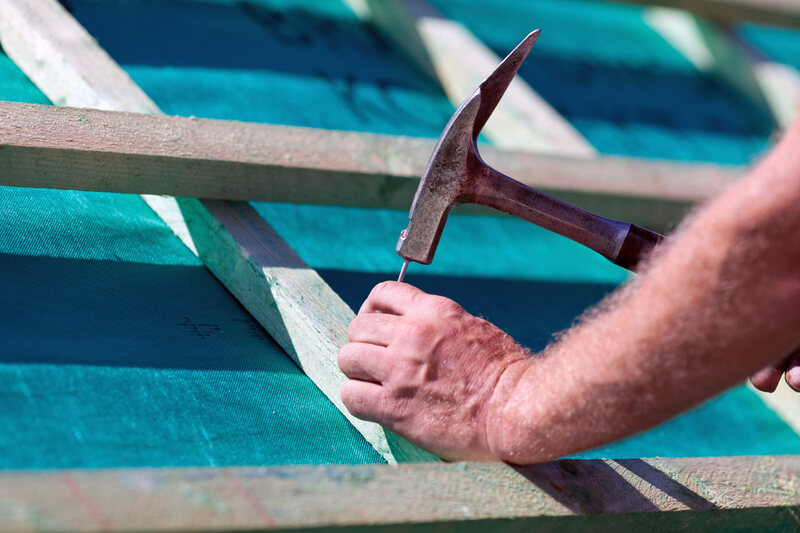 Many of the roofing tools have more than one use in the installation, repair, and demolition of roofs. A roofing hammer is a must in every roofing professional’s arsenal. This handy and versatile tool will have one end dedicated solely to setting nails. The other end is a hatchet designed to split shakes or shingles. Some hammers will have gauges or even levels built into them. Roofing knives with holsters are one of those tools that have multiple uses. These knives are made to cut shingles but are useful for other applications such as anything you would use a regular utility knife for. An angled roofing knife helps reach areas that are difficult for a straight handled blade to reach and it is also easier on the hands during long periods of use. A retractable steel tape measure is something everyone needs, not just roofing professionals. Which is why there is not a lot of explanation needed for this toolbox necessity. Having a measuring device handy is essential for any roofing project. Plumb line and chalk line are toolbox staples. These are used in conjunction with the tape measure and they improve the accuracy of roof installation. The plumb line allows you to set up accurate reference points for setting the chalk lines. This is very handy for laying out chalk line marks for the layout of the installation. 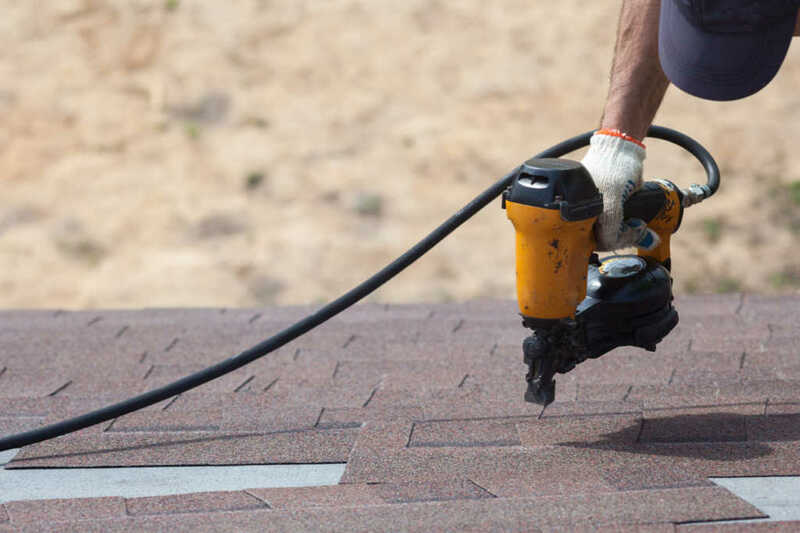 An air knife makes the cutting of shingles a much quicker and less labor-intensive job. They quickly slice through most types of shingles with ease although this does require an air compressor to power it. A hammer stapler is the most efficient way to affix roofing staples to thicker roofing materials. It is similar to a nail gun but uses the heavy, non-rusting staples instead. (This is another tool that requires the air compressor.) Smaller manual staplers are also on the market which works well for lighter jobs. A pry bar is invaluable in pulling up roofing materials and removing other objects such as old studs, boards, and structures. 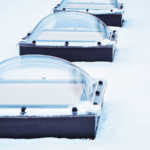 A roofer who regularly removes and replaces roofs will most likely have several pry bars. They make use of differing lengths and strengths for the various jobs. Shingle removers come in various forms. Handheld or push broom versions with handles of three to four feet long are useful for smaller tasks. The larger mechanical shingle removers are used for projects that are big and tough. Shingle saws are also found in both handheld and mechanical versions. Cutting edge variations are designed to cut and shape various styles of shingles. The shingle material being cut will require the correct saw and blade to get the job done right. Roofing hatchets come in many different forms. The features can vary but many are magnetic, some have gauges, or laws, while others have lights. The needs of a particular job will determine which hatchet will be the most useful at the time. Seam rollers are another tool that offers different choices. The rollers themselves are made out of rubber or steel. There are smaller handheld models for the little repair jobs and long-handled models that are perfect for the bigger projects. Roofing shovels aid in tearing up shingles and pushing them out of the way. They should also safely remove the nails that attached the old shingles to the roof. 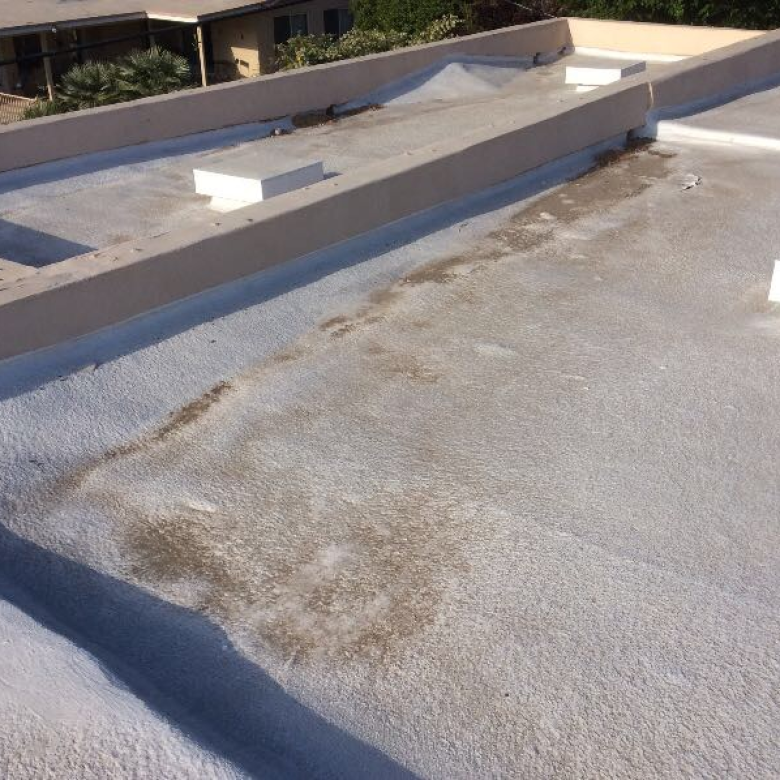 A clear surface with no nails or old roofing debris is the goal. Several blade variations are available with smooth and serrated being the most common. The serrated blade ensures each old nail gets pulled up and disposed of. A magnetic sweeper is helpful especially during cleanup. Their powerful magnets pick up metal shavings or debris along with any dropped nails. The roofing tools listed in this article are limited to the 13 most commonly used. On an average day, roofers use many more tools specific for each part of their job and have the knowledge and skill to use them correctly. 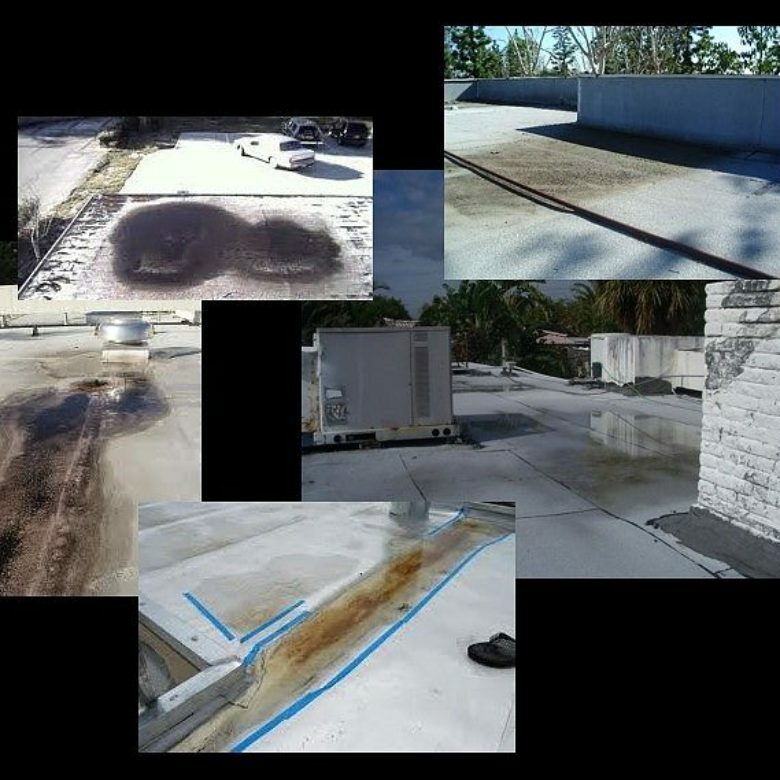 If you want to learn more about roofing tools along with proper roof care and maintenance and also ways to eliminate ponding water, contact the professionals at RoofSlope.